The DB models from Showtec are universal DMX-512 optical splitters. They are designed to distribute the incoming DMX signal, in daisy chain configurations, into multiple separate outputs with an additional âTru" port. They can be mounted in any 19" rack or into the truss by the M10 nut on the rear end of the unit. It has clear LEDs to show the DMX signal status of each output and input. 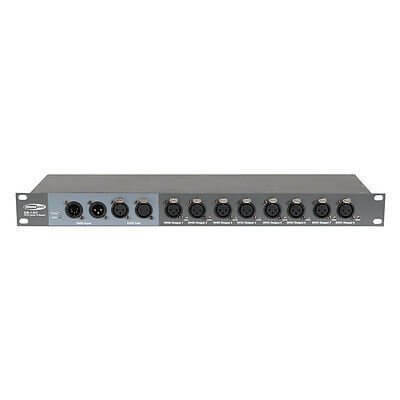 There are two models available, DB-1-4 with 4 outputs and 3 & 5 Pole XLR connectors and the DB-1-8 which has 8 outputs with 3P XLR connectors.